Credit Officer : 38 posts (UR-19, OBC-10, SC-6, ST-3) in MMG Scale-II, Salary :Rs. 31705-45950, Age Eligibility : 20-30 years as on 30/09/2016.Risk Manager : 23 posts (UR-12, OBC-6, SC-3, ST-2) in MMG Scale-II, Salary:Rs. 31705-45950, Age Eligibility : 20-30 years as on 30/09/2016. Aspirants are liable to pay Rs.500/- which has to be paid online. (No fee will be chargeable from SC/ST/PWD candidates). Selection for the posts will be through written examination which will be held on 04/11/2016. 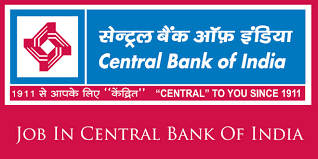 Candidates can apply Online from 15/09/2016 to 30/09/2016 at Central Bank of India website.